Beautiful Beechwood and stainless steel Multi tool is the perfect garden tool. Makes a Great gift for a gift bag new home owner or any garden lover. Folds up for convenient storage. Tool includes: trowel, weeder, saw, root remover and pruning knife. Tool measures 2.6" x 5.7" x 1". Enjoy all of your DVD movies anywhere on the built-in 7" LCD screen! Relax with this portable device anywhere on the go! Features include: stream music wireless with Bluetooth, play CDs, MP3s, or AM/FM radio broadcasts, or play digital media from USB memory sticks or SD/SDHC memory cards, twin speakers with powerful full-range drivers, composite A/V output, headphone jack, 3.5mm AUX and microphone input, uses AC or DC power cord (included) or 8 "C" batteries (not included) and a convenient remote control. Unit measures 16 x 6 x 8 inches. Why waste time running back and forth to the mailbox? Let Mail Chime's wireless mail alert system do it for you. This wireless solution couldn't be any easier to install -- simply mount the sensor on your mailbox door and plug the receiver into the wall in your home. When the mailbox door is opened, four audible beeps will sound and a bright red LED light will turn on. The range is 450 feet. It is powered by a 12-volt battery which is included. It is not designed to be used on mailboxes with vertical hinges such as cluster type community mailboxes. It measures 4.2 x 1.2 x 1.2 inches. This Talking Portable Luggage Scale helps you avoid paying overweight luggage fees when you arrive at the airport and is ideal for the blind and those with low vision. Scale has a large back-lighted LCD readout (1.65" long x 1.10" high) with an even easier talking feature that tells you the weight. Features include: Push-button control allows you to choose the units of measurement: lb, oz, or kg, maximum Weight: 66 lb (30 kg); Minimum Weight: 1.76 oz (0.05 kg), and requires 3 AAA batteries (not included). Scale measures 4 3/4" long x 3" wide x 1" deep. Equipped with Cell ID Chipset technology, the Power Bank 4000 automatically recognizes connected devices and adjusts power output for the quickest charge time. Capable of charging most modern smartphones in just 90 minutes, the Power Bank 4000 features a bright LED power indicator, perfect for identifying at a glance how much power remains in the device. Compact and lightweight, this emergency charger slips easily into a jacket or coat pocket. Not just a plain old spinner! There's lots of spinners, but our new hand spinner is unique. The only spinner that is also a bluetooth speaker. Slide the switch, then bluetooth it to any bluetooth device. Have fun spinningthe this fun hand spinner while listening to your favorite tunes. 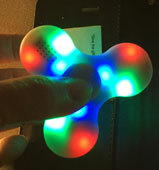 Spinner's lights flash as it spins!USB cord (not included) Spinner measures 3" in diameter. This micro vacuum is perfect for your desk, or even traveling in your car. The convenient 4 foot USB cord easily plugs into computers and other USB power adapters allowing you plenty of room to operate. The good news is that batteries are not required. It also comes with a handy reusable filter. Don't let the size fool you, our miniature vacuum has excellent suction and is ergonomically designed. Music on the go! Whether beginner or pro, this smallest harmonica packs loads of fun for all! A real working harmonica made with sturdy metal cover and base plates and plays in the key of C. Fun real instrument at your fingertips on a handy keychain. Comes in assorted colors (our choice please). Harmonica measures 1 1/2" x 1". For ages 6 and up. Stay cool, calm and collected this summer with our new handheld misting fan. Let its cooling mist Keep you cool on the hottest days of summer. Just fill the plastic container with water, press the button to activate the fan and press the lever to create a cooling mist. Easy to take on that next camping trip or outdoor picnic. Fan stands 11" tall and requires 2 AA batteries (not included). Introducing the world's first combination talking bible and digital recorder and a FM radio. Our pocket-size bible speaks all the books of the Bible, old and new Testament, in a real human voice. You can jump from book to book and chapter to chapter with the press of a button. You can also jump ahead or back in 15 second intervals. You can also listen to your favorite radio stations. The bible comes with 8GB of on board tamper proof memory. Learners can also use the recorder feature to record notes. Memory can be expanded up to 64GB by inserting a micro SD cards. It comes with intuitive navigational keypad with raised buttons, stereo audio jack and Micro USB port for charging. It also has variable speed playback. Bible comes with on-board audio instructions, earbuds, USB cable and print instructions. Unit is only 2 x 4 x 1/2 inches.